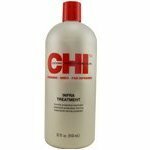 CHI Infra Conditioner 32 oz. CHI Infra Treatment is specifically developed to work in conjunction with the CHI line. CHI Infra Treatment with Cationic Hydration Interlink is a superior moisturizing and protecting treatment. Hair will be left with the proper balance of moisture for silky manageable hair with incredible shine every time. Notify me of updates to CHI Infra Conditioner 32 oz.